Nevada Mineral & Book Company (NMBC) was established in 1985, when we started selling mineral specimens and out-of-print publications at gem & mineral shows and through mail order. In 1989 we acquired the inventory of the Mineralogical Record Book Department, and incorporated in-print books and journals into our offerings. Over the past 20 years, we have evolved to offer the researcher, educator and collector a wide variety of publications and specimens in a "one-stop" shopping environment. In 2001 we opened our first retail location in Henderson, Nevada. In August, 2009 we relocated and opened our new store and gallery in Orange, California. We offer a wide variety of new, used and out-of-print publications, as well as mineral and fossil specimens, lapidary and decorator items, and mining stock certificates and other ephemera. We have one of the largest inventories of earth science-related publications in North America, so plan on staying a while if you come to visit our store while in Southern California. You will not be disappointed. Walter Lombardo is a geologist with over 30 years experience related to mining and mineral exploration. For 16 years, he managed the Las Vegas Office for the Nevada Division of Minerals. He has also worked for several mining and exploration companies, most recently managing the North American exploration program for a Canadian junior mining company. Walt's expertise is mineralogy and geologic information. 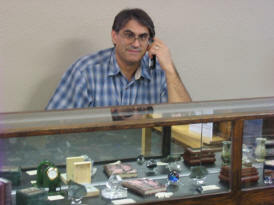 Walt has over 30 years experience selling, collecting, and purchasing mineral specimens and related earth science materials and books. He now manages the retail store full-time.